Never Enough Nails: Lynnderella Friday, Vol. 65! Sorry so late with this post today, but this morning I had to go run out to battle to the death finish my Christmas shopping at the mall. I can't believe tomorrow is Christmas Eve already! I hope all of my readers have a wonderful holiday season and spend some well-deserved time with loved ones. Today I have two more Lynnderella Advent polishes; sadly, we're getting down to the end of these! 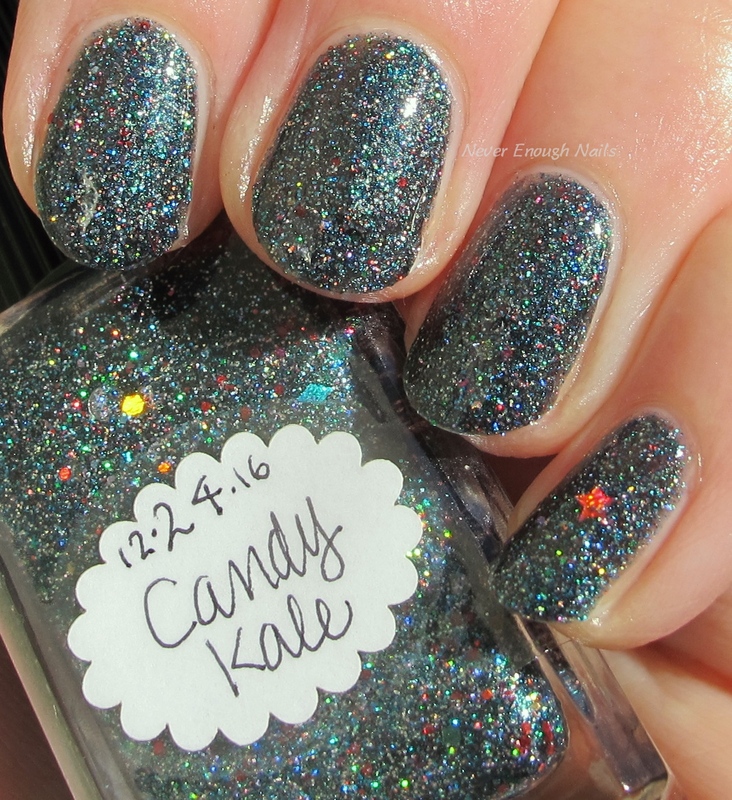 Lynnderella 12-24-16 Candy Kale is a perfect dark kale green shimmer with sparkly holo teal microgliter and some accent glitters in bright reds and other festive colors. 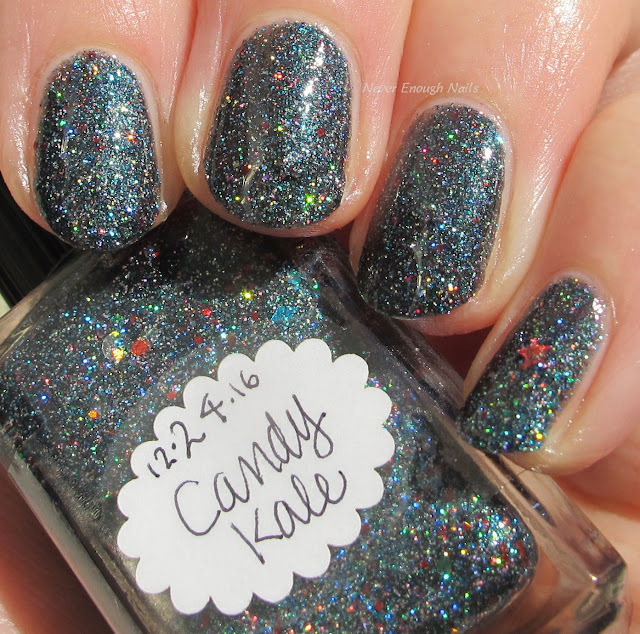 I also saw some mini silver holo stars in there too (I actually got one on my middle nail but accidentally covered it- oops!). Candy Kale is such a gorgeous green, it's a very rich unique shade of green. 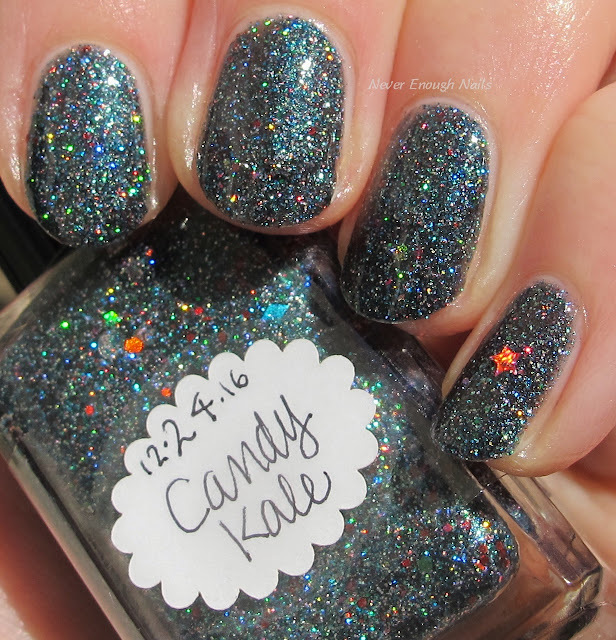 All the holo sparkle doesn't hurt, either! This is two coats and application was very easy. Although it looks super glittery, it actually is more smooth, thanks to the shimmer base. One layer of top coat is perfect for ideal smoothness and shine. Lynnderella decided to carry on a bit past Christmas this year (no complaints here! 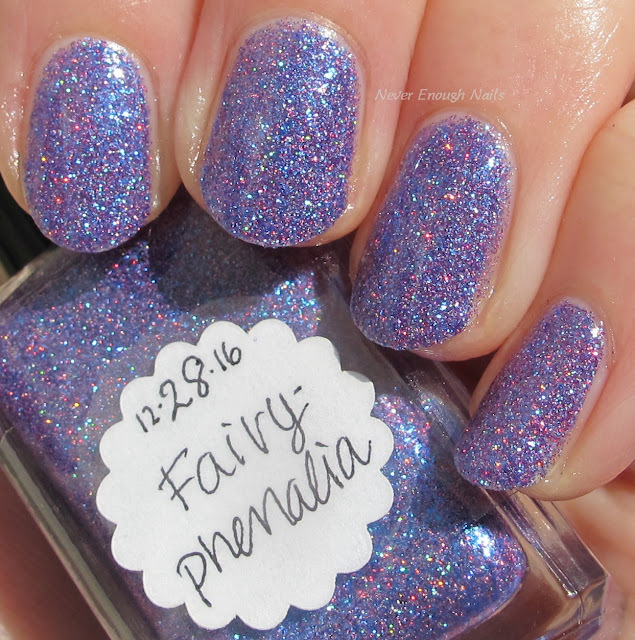 ), so we have Lynnderella 12-28-16 Fairyphenalia. 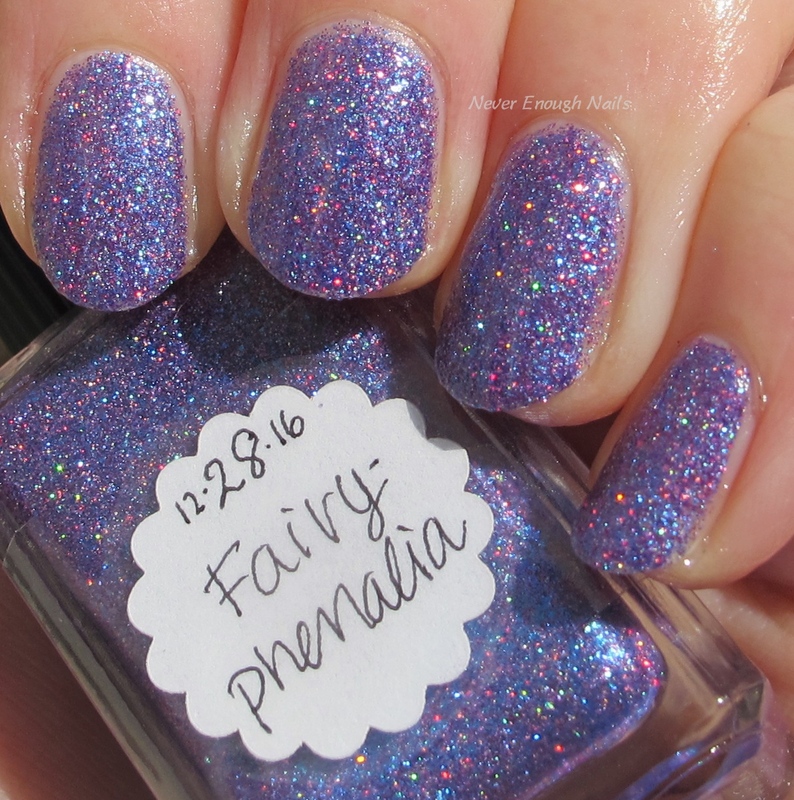 Fairyphenalia is pretty much my ideal purple glitter polish. I don't think it gets better than this. 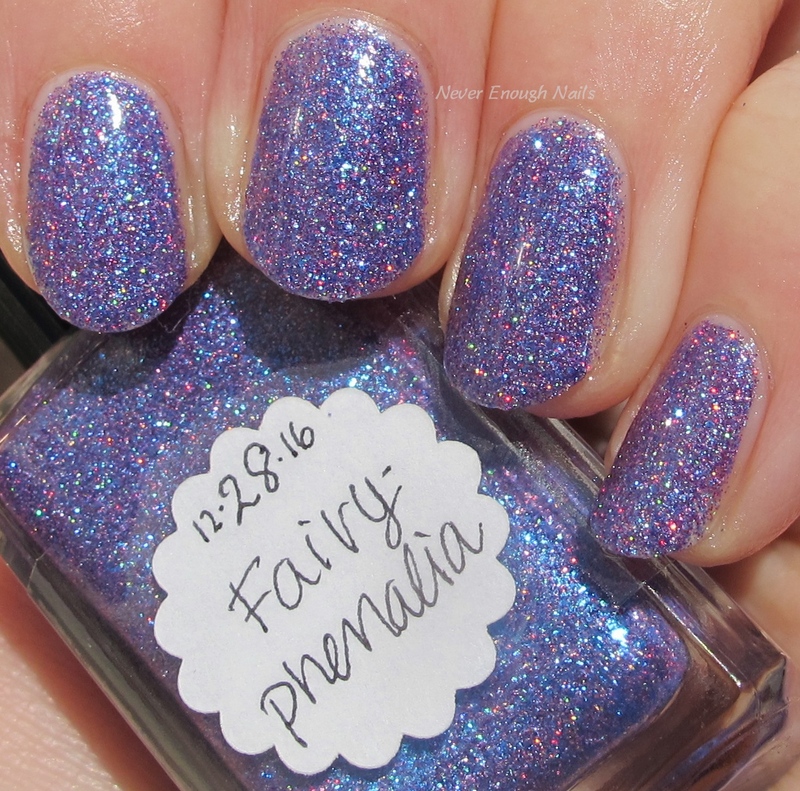 It glows with a periwinkle/lavender shimmer and has an insane amount of holo sparkle. 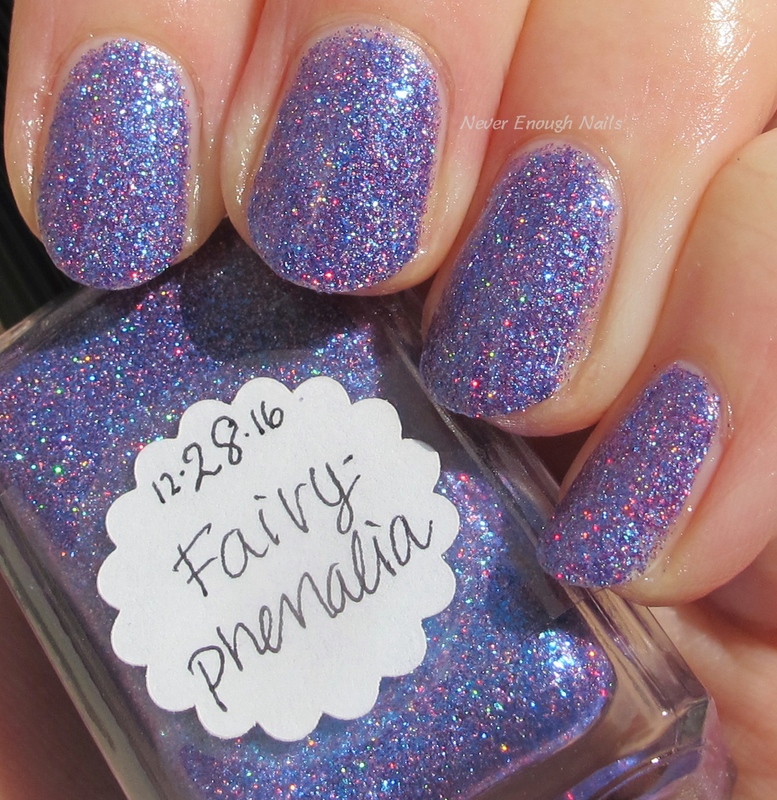 Lynn describes this one as a "blue violet shimmerella with holographic purple microglitter, electric blue micro flakes and cyan shimmer". I describe it as GORGEOUS!!! Two coats to pure purple-loving joy here! Like Candy Kale, it is a smoother finish than it looks and just needs one layer of top coat. Application was a total breeze and I didn't even need to do any clean-up. This pretties are available now on http://stores.ebay.com/lynnderella-lynnderella. You can also get more lovely Lynns at lynnderella.com.